Sabooni, S., Aghaei, Z., Karimzadeh, F., Enayati, M., Ngan, A. (2014). Austenite Stability during Nanoindentation of Ultrafine and Coarse Grained AISI 304L Stainless Steels. International Journal of Iron & Steel Society of Iran, 11(2), 1-5. S. Sabooni; Z. Aghaei; F. Karimzadeh; M. H. Enayati; A. H.W. Ngan. "Austenite Stability during Nanoindentation of Ultrafine and Coarse Grained AISI 304L Stainless Steels". 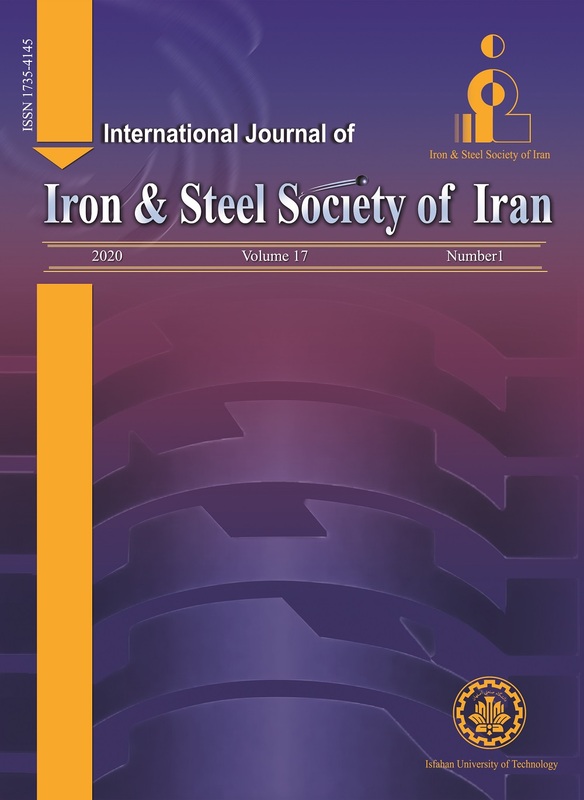 International Journal of Iron & Steel Society of Iran, 11, 2, 2014, 1-5. Sabooni, S., Aghaei, Z., Karimzadeh, F., Enayati, M., Ngan, A. (2014). 'Austenite Stability during Nanoindentation of Ultrafine and Coarse Grained AISI 304L Stainless Steels', International Journal of Iron & Steel Society of Iran, 11(2), pp. 1-5. Sabooni, S., Aghaei, Z., Karimzadeh, F., Enayati, M., Ngan, A. Austenite Stability during Nanoindentation of Ultrafine and Coarse Grained AISI 304L Stainless Steels. International Journal of Iron & Steel Society of Iran, 2014; 11(2): 1-5. In the present study, the effect of grain size on the austenite stability was studied by nanoindentation tests in a 304L stainless steel. Thermomechanical processing based on cold rolling and annealing was used to produce two different types of austenite: ultrafine grained (UFG) austenite with the average grain size of 0.65 μm and coarse grained (CG) austenite with the average grain size of 12 μm. Scanning Electron Microscope (SEM) and Transmission Electron Microscope (TEM) were used to follow the microstructural changes during rolling and annealing. The results of nanoindentation tests showed popin in the load-displacement curve of the CG sample while no observable pop-in was found in the UFG sample. The slope of (P/h) versus h plot, where P was load and h was displacement, was changed after the occurrence of each pop-in event in the CG sample. This behavior was related to the change of plastic deformation mode due to the martensitic transformation. The present results, therefore, confirmed that the UFG austenite had higher stability to withstand martensitic transformation. J.R. Davis, ASM Specialty Handbook: Stainless Steel, Met al.s Park, OH, 1994. V.S.A. Challa, X.L. Wan, M.C. Somani, L.P. Karjalainen, R.D.K. Misra: Mater. Sci. Eng A., 613 (2014), 60. R.D.K. Misra, S. Nayak, S.A. Mali, J.S. Shah, M.C. Somani, L.P. Karjalainen: Metall. Mat. Trans. A., 41(2010), 3. S. Rajasekhara, P.J. Ferreira, L.P. Karjalainen, A. Kyröläinen: Metall. Mat. Trans A., 38 (2007), 202. A. Momeni, S.M. Abbasi: J. Mater. Sci. Technol., 27 (2011), 338. S. K. Varma, J. Kalyanam, L. E. Murk, V. Srinivas: J. Mater. Sci. Lett., 13(1994), 107. T.H. Ahn, C.S. Oh, D.H. Kim, K.H. Oh, H. Bei, E.P. George, H.N. Han: Scripta mat., 63 (2010) 540. K. Sekido, T. Ohmura, T. Sawaguchi, M. Koyama,H.W. Park , K. Tsuzaki, Scripta mat., 65(2011), 942. B.B. He, M.X. Huang, Z.Y. Liang, A.H.W. Ngan, H.W. Luo, J. Shi, W.Q. Cao and H. Dong: Scripta Mat., 69 (2013), 215. G.B. Olsen., M. Cohen: Metall. Mat. Trans. A., 6 (1975), 791. K.H. Lo , C.H. Shek, J.K.L. Lai: Mater. Sci. Eng R., 65 (2009), 39. T. Kruml, J. Polak, S. Degallaix: Mater. Sci. Eng A., 293 (2000), 275. C.X. Huang, G. Yang, Y.L. Gao, S.D. Wu, S.X. Li: J. Mater. Res., 22 (2007) 724. S. Takaki, K. Tamimura, S.Ueda: ISIJ International., 34 (1994), 522. R.D.K. Misra, S. Nayak, S.A. Mali, J.S. Shah, M.C. Somani, L.P. Karjalainen: Metall. Mat. Trans. A., 40(2009), 2498. C. P. Poole, F.J. Owens, Introduction to nanotechnology, Wiley Interscience publication, 2003. K.L. Johnson, Contact mechanics, Cambridge university press, Cambridge, 1985. W.C. Oliver, G.M. Pharr: J. Mater. Res., 7 (1992), 1564.